4 large size – 28×20 inch (70×50 centimeter) and 4 medium size – 24×16 inch (60×40 centimeter). 180 DAY WARRANTY! 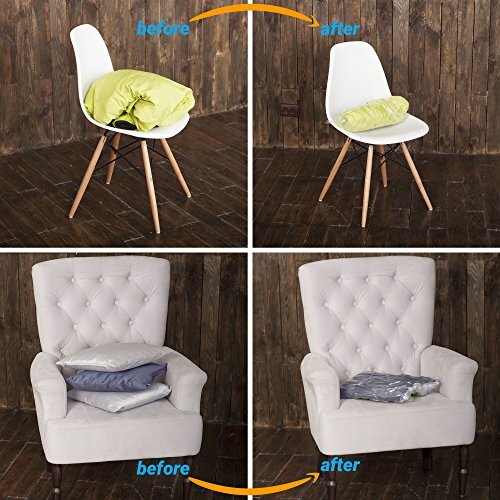 If you don’t like the space saver organizers, we’ll buy them back! 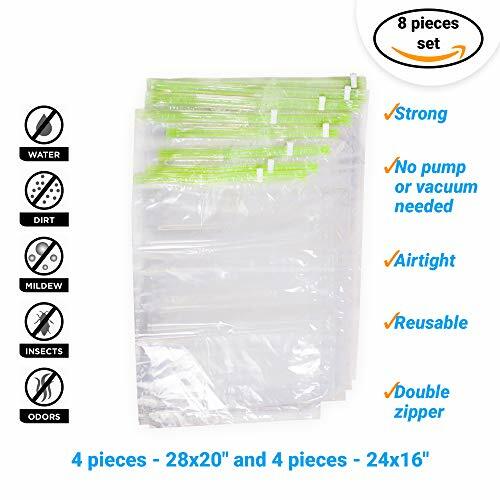 With The Chestnut Space Saver Storage Bags (organizador de ropa) purchase you get 8 Transparent Roll Up Travel Storage Bags with green double-zip seals: 4 large size – 28×20 inch (70×50 centimeter) and 4 medium size – 24×16 inch (60×40 centimeter). ✔Are odors, bugs, moths, dirt and dampness your worst enemies when it comes to traveling or the seasonal storage of your clothes. 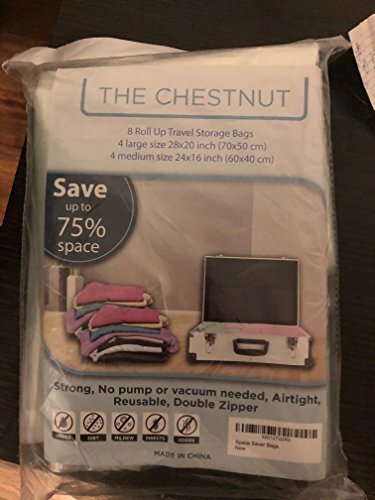 Not only do The Chestnut Space Saver Bags protect your clothes, towels, sheets, and pillowcases from these local disasters, but they also reduce the storage space by up to 75%. ✔Do you want to be the envy of all of your colleagues by having the smallest suitcase on your next business trip. 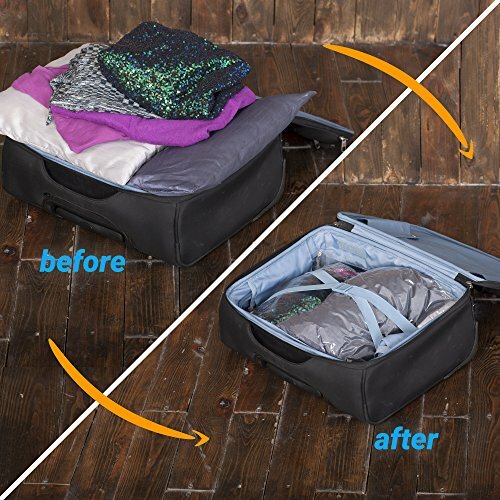 Now you will be able to take with you only one suitcase instead of three. ✔Compression bags are reusable, so we hope they will have some quality time visiting all the interesting places you go to. 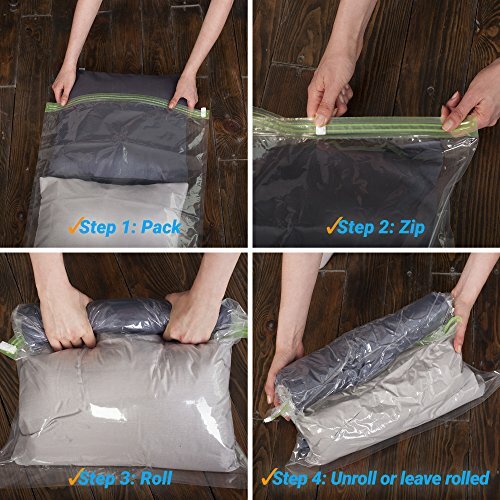 ✔Why are we telling you that The Chestnut Space Saver Bags are irreplaceable for travelers? You don’t need a vacuum or pump to use them, just roll the bag starting from the zipper to push the air out through the valves on the other side of the bag and you are ready to conquer the world with your tiny suitcase packed with all your belongings. 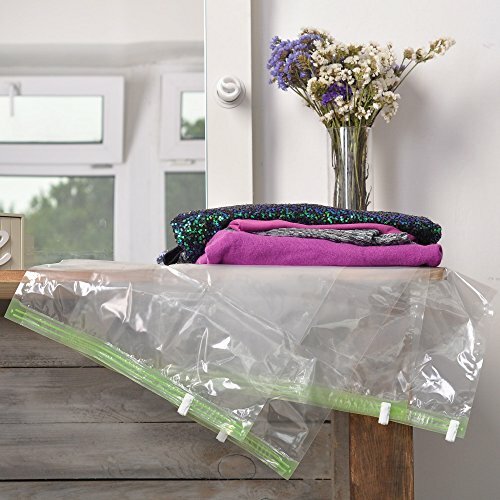 Now you are on the verge of buying the best Space Saver Compression Bags ever. All you need to do is to click the “Add To Cart” button at the top right of this page and you will have your Bags in a few days! 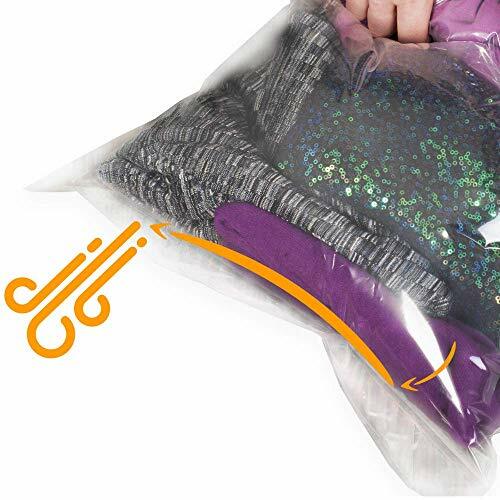 You don’t need a vacuum or pump to have vacuum packaging for clothing to use the plastic bags. 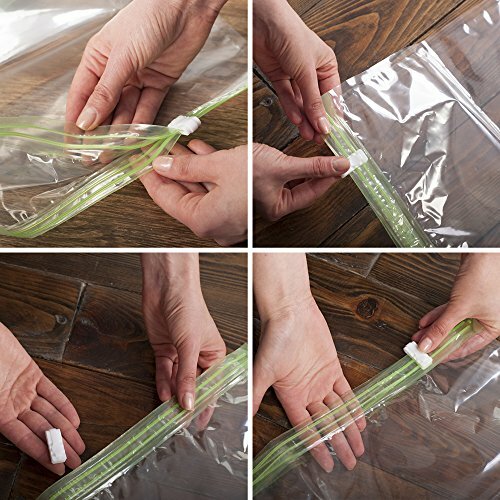 All you need is to zip the roll up suction bags for travel and roll in order to push air out through the valves at the bottom of the bag. 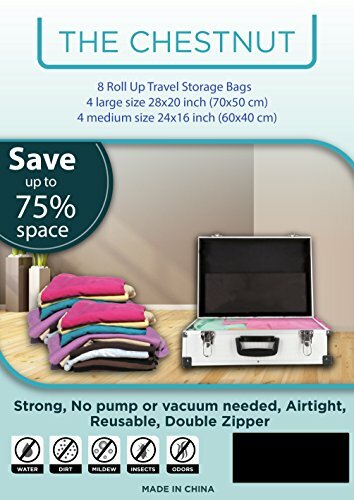 The Chestnut space saver bags are perfect for clothing storage, towels, sheets and pillowcases at home for seasonal storage: at your country house, in your car, or at survival camp during a zombie attack. Can be used as a dirty clothes organizer.